Hello everyone! Happy Friday to you! What a week it’s been – there are some really exciting things in the pipeline that I can’t wait to share with you but in the meantime, here is my latest nutritious and delicious discovery! 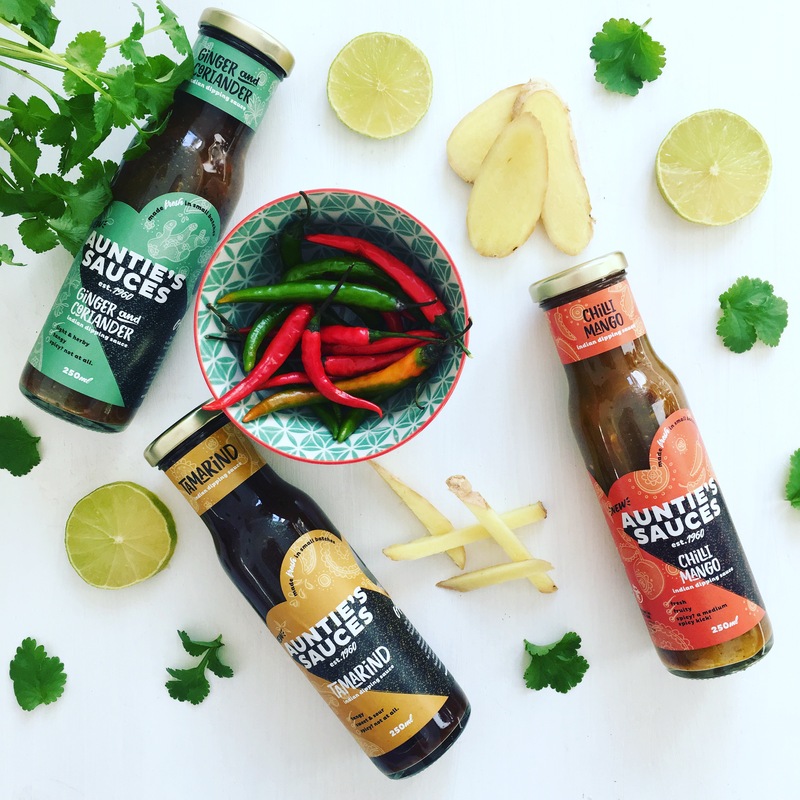 You know how much I LOVE trying new and exciting products so imagine my sheer joy when these 3 bottles of wonderment from Auntie’s Sauces arrived! 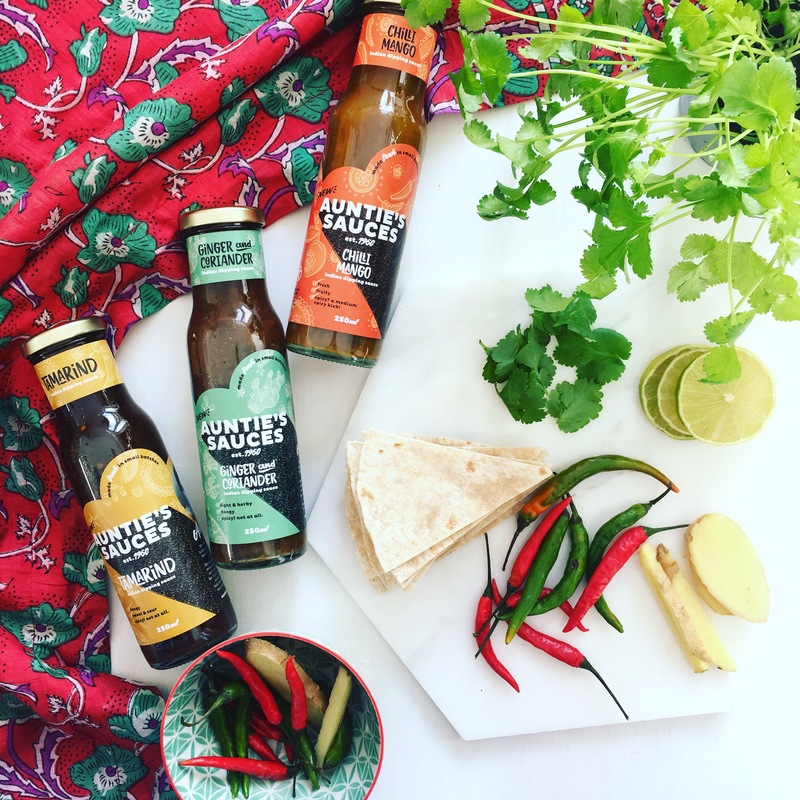 I absolutely adore the flavours, fragrances and vibrant colour of beautiful India and these delicious dipping sauces completely encapsulate this majestic and awe-inspiring place. I visited India about 12 years ago. My grandfather grew-up not far from Mumbai so I’ve always felt an affinity with it – I was completely overwhelmed by the history, the stories, the heady aromas of chai, cardamom and insence that filled the air. Every family seemed to have a tale to tell, their own individual way of brewing chai or their particular theory or explanation as to why the humble marigold-adorned cow is so revered! I couldn’ve spent all day, (I did actually spend most days to be honest), listening to these charming stories, completely engrossed by the intricate detail that painted the most vivid pattern in my mind. I think that’s one of the reasons why I love these sauces so much. The story behind their creation is as wonderful as their taste! Auntie, otherwise known as Mrs. Pannam came from India to England in 1960. Armed with her back-combed bun and an inherent knowledge of flavour, she ran a successful restaurant Indian restaurant where she was lovingly nicknamed ‘Auntie’ by her regulars. After retiring, people still asked for her sauces and to this day, they are made using the original recipes. 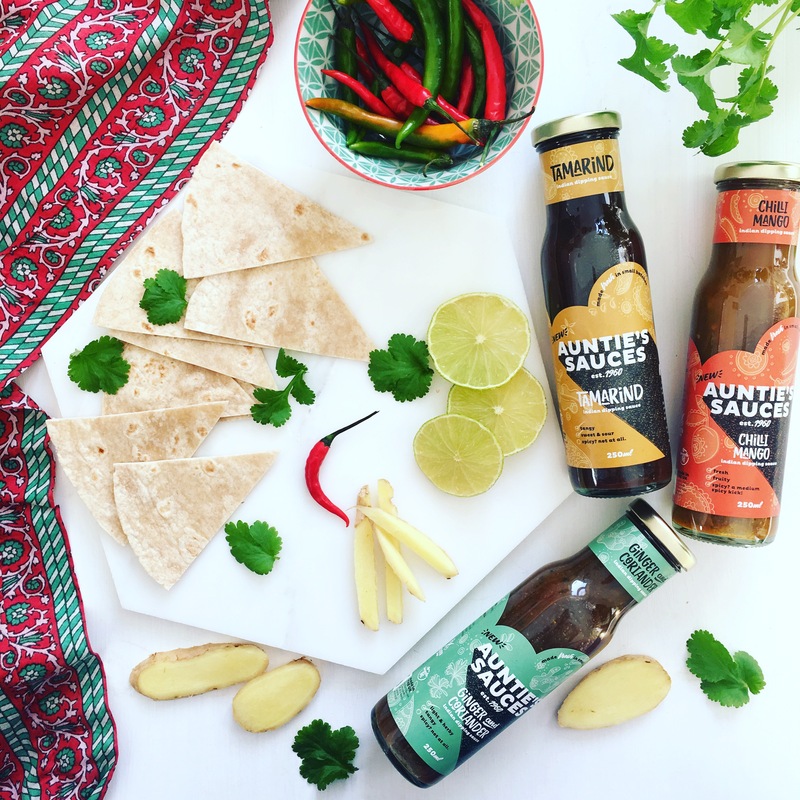 All Auntie’s Sauces are made freshly and in small batches. They are gluten free and vegan and can be used for dressing, dipping (and/or marinating). They are so delicious and fragrant and they really evoke the authentic Indian experience. I had the pleasure of trying all of the flavours; Ginger & Coriander, Chilli & Mango and Tamarind. Fresh, zesty, fragrant, perfectly-balanced, they are light with the perfect hit of spice. 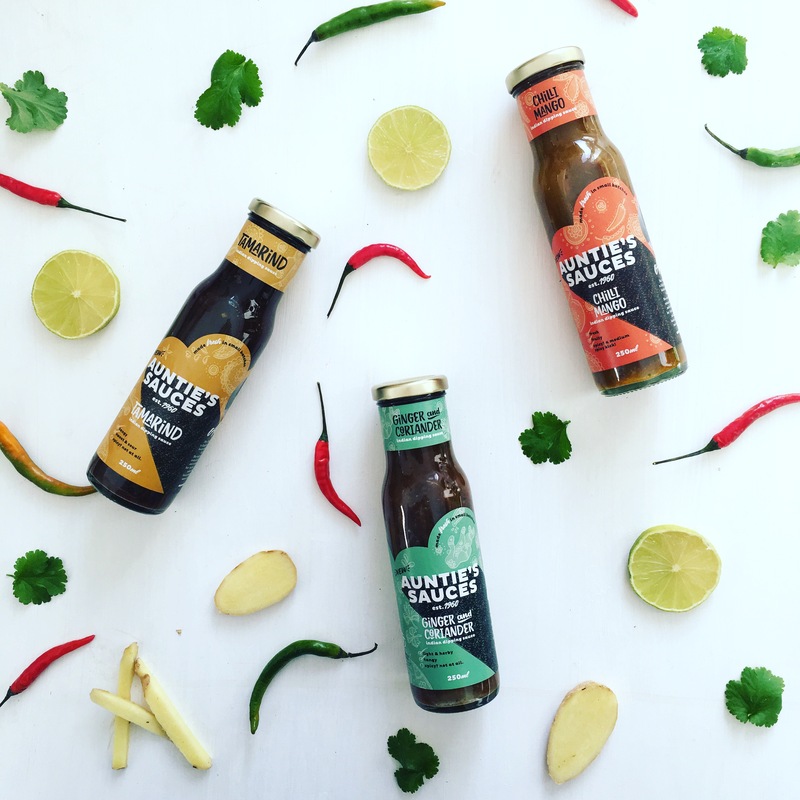 You can purchase them online via the Auntie’s Sauces website and they are being stocked in various outlets across the country; closest to me is Dandelion Deli on King’s Road, St. Leonard’s-on-Sea (where I first discovered them). This amazing deli is jam-packed full if beautiful, healthy products and they cook their hot meals freshly every morning using the the best, seasonal ingredients. If you ever find yourselves in St. Leonard’s, you must swing-by to see Will and the Team! They’re a canny bunch and with a downstairs restaurant and secluded courtyard garden, there’s plenty of places to find your perfect coffee-time spot. You can see Auntie’s latest over on their Instagram and don’t forget guys that I create copy and take fab pics of products so get in-touch if you have any social media management needs! I’m your girl! Head over to my Instagram to see my healthy recipes, pics, reviews and health tips! My shop is now live also, you can purchase my NourishMe Wellness Box as well as recipe cards and artwork. I hope you’ve enjoyed reading this review, please feel free to leave any comments below.